He’s coming home, he’s coming home. Tell the world he’s coming home. Who’s coming home? Michael Myers (Nick Castle), of course. Where’s he returning to? Haddonfield, Illinois, the scene of his infamous massacre 40 years ago on Halloween night. Since that night, Myers has been incarcerated in Smith’s Grove Sanitarium, with many futile efforts made to understand why this man could commit such atrocities, and not feel the need to say why. Since that night, sole survivor Laurie Strode (Jamie Lee Curtis) has had to deal with immense stress and the failure to live a normal life after this incident. Each day, she prepares for what she believes to be the inevitable. During the night that Myers is due to be transported between prisons with other inmates, the bus crashes. All are accounted for…except the one man that needed to be. Myers has escaped and sets a waypoint to Haddonfield. On this Halloween night of 2018, The Shape has emerged from imprisonment, ready to spare no lives whether Laurie’s, her daughter, Karen’s (Judy Greer), or Karen’s granddaughter, Allyson (Andi Matichak). For as awesome as this horror genre boom has been over the past few years in mending, molding, and combining different themes and approaches, there has been a sizable void in the wide release slasher offering. What better way to fill this void than by rebooting not just one of the most influential horrors, but movies, of all time? Sure Halloween 2018 isn’t exactly a reboot, branding itself as a direct sequel—which it is to John Carpenter’s 1978 Halloween—but, it’s telling that there’s no number following the title or some stylized version. 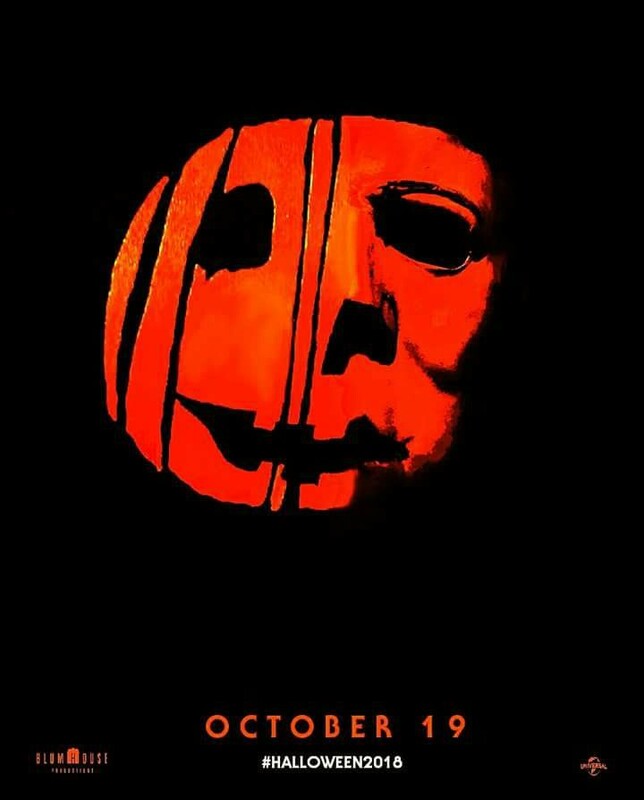 This iteration of Halloween is probably the best version of a 21st century slasher we could get. The big question: Is Halloween scary? On a scale of 1-10, let’s say a 6.5 max. It’s an assortment of solidly frightening moments, but one may be hard pressed to say it is consistently drenched in fear. When working with something that has defined a genre, you’re somewhat beholden to it also. That’s to say that the tropes and setups of the slasher corner of horror are found here, especially in a final act that—albeit a crowd-pleasing good time—is the weakest act of the three, caught between an awkward tonal mix of self-awareness and obliviousness. However, director David Gordon Green (Pineapple Express, Eastbound & Down, Stronger) exhibits a good understanding of what the best type of movie Halloween is, which can be seen in the first two acts. As a killer, Michael Myers isn’t as nimbly swift as Freddy Krueger, nor is he a big plodding bruiser like Jason Voorhees. He’s in the middle of this spectrum, but, he always moves with a methodical purpose and precision. This is the same method that Green takes. Halloween takes its time in unleashing the malevolent masked murderer, beginning with a gorgeously shot mental ward sequence that tells the audience everything needed to know about Myers…which is nothing. Green and co-writer/longtime collaborator Danny McBride honor the 1st by doing away with explaining the motive of Myers. Some actions can never be explained. Despite absolving pretty much everything that followed the OG, the duo pay tribute to about everything that has been seen, be it clever lines of dialogue or specific callback shots, with the best example being a three-minute long tracking shot that commences with Myers’ return to Haddonfield. All of this is an old-school approach done with a little new school flair and cinematography, bolstered by a dark score from Carpenter, his son, Cody, and his god son, Daniel Davis. This version of Halloween is a good middle ground between the original vision and Rob Zombie’s rebooted vision. There’s more blood and gore here than 1978, but significantly less than 2007 and 2009. The violence enhances the menace of Myers while rarely feeling exploitative. If the elder Carpenter serves as the soul of the entire Halloween franchise, Curtis is the heart. She’s deeply attuned to Laurie, with Green/McBride providing a significant emotional tether for the audience. Her Laurie is deeply scarred, a victim of a horrible situation, yet refusing to be powerless. It’s a sneaky impressive performance that allows Curtis to show a bevy of range. She’s not the only old returnee who returns home. Watching the 71-year-old Castle stalk and eradicate his prey with old man strength and an emotionless facade is a novel idea that further provides legitimate connective fibers to the past. There are a ton of characters that serve as fodder, and specific efforts to integrate them as anything more feel hollow. But, in the event this new Halloween moves forward—and it will—the unknown Matichak inspires enough confidence to hold down the protagonist role. Things evolve, including what makes us scared. It’s difficult to know for sure if a truly unnerving slasher can be done in this day and age. The 2018 homecoming of Halloween is missing a bit of the thick atmosphere and even subtle social messages that defined the classic. Still, it’s tough not to get taken aback by the entertaining return of Michael Myers. Photo credits go to impawards.com, boundingintocomics.com, IMDB.com, and buzzfeednews.com. Good stuff. Looks like I’m going to miss out on it this weekend but will be seeing it soon. Several of their decisions has me a little cautious. Still don’t know how I feel about dumping the timeline (particularly Halloween 2 which is a pretty good direct sequel). I never seen Halloween II! So, no real opinion of the dumping, but, I do think it’s pretty cool and perfectly neat this happens 40 years after the original. I saw it this afternoon and thought it was good. Critics and many other will hate it but true horror movie fans will appreciate it for what it is. Thanks for commenting! Looks like most of the audience is aligned with the critics. This will definitely be a movie that I’d have in my Halloween rotation. I haven’t read any reviews. People don’t like it or critics do? Most people (let’s say 8 out of every ten) seem to like it, “critics” and basic moviegoers. Wow, that’s surprising. I liked it but my opinion and that of others don’t always line up. Good review. Personally, I liked this movie. Its streamlined and tells its story quick and entertainingly fun. Thanks. Oh yeah, I think my thoughts were pretty positive. I’d been buy this movie on Blu-Ray and watch every Halloween.